By now you’ve probably heard and felt the power of maracatu online or in person. Maybe you’ve joined your local maracatu group and want to sharpen your skills and knowledge before the next rehearsal or you’re an educator seeking new vocabulary to add to your teaching curriculum. 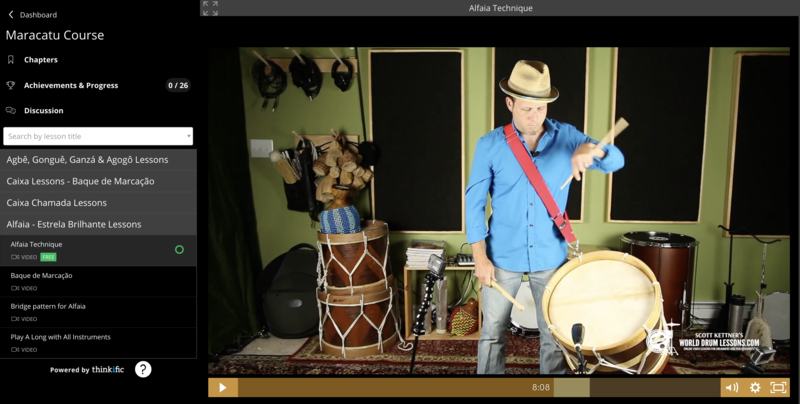 When you subscribe to this Maracatu Course you’ll get instant access to the entire library, complete with PDF’s and transcriptions embedded into each video lesson. This course can be broken down into two categories; there’s instructional lessons that focus on developing good technique and repertoire lessons that focus on arrangements, styles and grooves from many of the traditional maracatu nations as well as material from my book "Maracatu for Drumset and Percussion". This course includes lessons suitable for absolute beginners as well as some that will challenge even the most experienced player, and, I upload new content every month. My goal is to help you develop good technique on your instrument and grow as an artist so that you can travel to Recife, Brazil one day and play with a traditional maracatu nation. You might also be interested in this lesson.